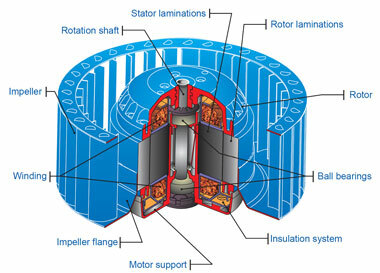 Technical - What is An External Rotor Motor? An extremely compact, therefore space saving unit, is produced by utilising the external rotor component as the hub of a fan impeller. Precision balancing is assured as the hub and impeller becomes one integrated unit of short axial length. Heat is very effectively removed in the airstream, assisted by the fan impeller that acts as a rotating heat sink of appreciable surface area. Speed control is then possible by low cost voltage variation because the extra heat generated in the rotor under speed control is lost directly into the airstream. Air filters can be ‘saved’ when clean but ‘air flow compensated’ when dirty by the tendency of centrifugal fans to speed-up as flow resistance increases. The increase in speed is more pronounced when using external rotor motors. 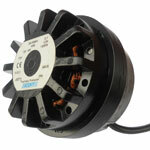 In general, the external rotor principle leads to small efficient motors, ideal for saving space within equipment. 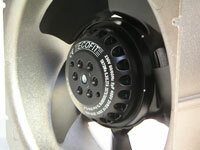 External rotor motors drive the majority of fans offered by our supplier partners, Ecofit and Rosenberg.